Welcome back to the fifth update of the 12-Month Produce Challenge! I hope you are still giving this challenge all you’ve got, because I know it is worthwhile for everyone in the family to try new foods, especially new produce. Is this the first time you’ve heard of this challenge? 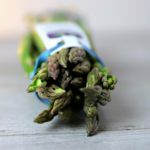 Get all the info about it in THIS post first and then you can return to find out what vegetable you and your family can try this month. The point of this challenge is essentially to become better at giving our families a variety of fruits and vegetables. Sometimes I think we get stuck buying the same foods over and over, but our bodies crave a variety of foods for optimal health. Other reasons to do this challenge are to eat in season and to discover new ways to enjoy foods that we might normally shy away from. This past month, my family and I tried arugula 9 different times. 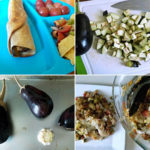 Most of the time we ate it as a salad, but there were some other interesting recipes that used the lettuce in creative ways. Arugula is a great spring veggie. While I know that my husband loves this lettuce more than others, we rarely buy it. I think it is a good idea for us to get more accustomed to arugula so we can reap the nutritional benefits. It wasn’t until 2011 that I tried arugula for the first time ever. We were on vacation in Portland, Oregon, and my brother-in-law put arugula on our sandwiches for a picnic. Suffice it to say, I wasn’t a fan. Fast forward nearly 7 years later, and I have only tried it maybe 5 or 6 times since. And I’m still not a fan. Or at least I wasn’t before this challenge. I was very surprised at the amount of recipes I found that call for arugula. Before this challenge, I would have only used it as the base for a salad and to put on a sandwich. Now I know you can throw it in smoothies, make pesto out of it, and use it in wraps, too, just to name a few other ways to use it. If you are looking for even more ways to use arugula besides the recipes I highlight below, this resource from The Kitchn can help you greatly. 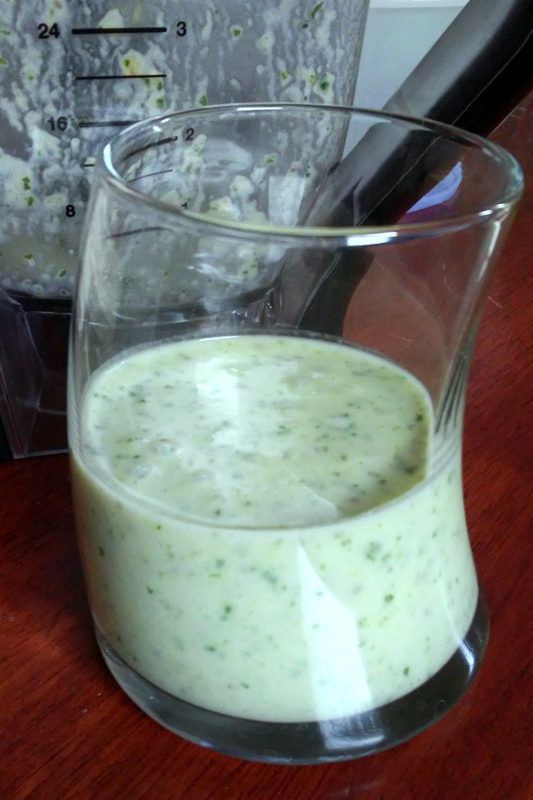 I was initially intrigued by a smoothie I found on Pinterest that included both pineapple and arugula. I ended up making my own smoothie with these ingredients because it didn’t look like a recipe I or my family would really enjoy. For anyone who makes their smoothies with spinach or kale already, then changing those out for arugula is an easy transition. If your family isn’t used to any greens in their smoothies, they will definitely notice the arugula taste and probably won’t drink it. 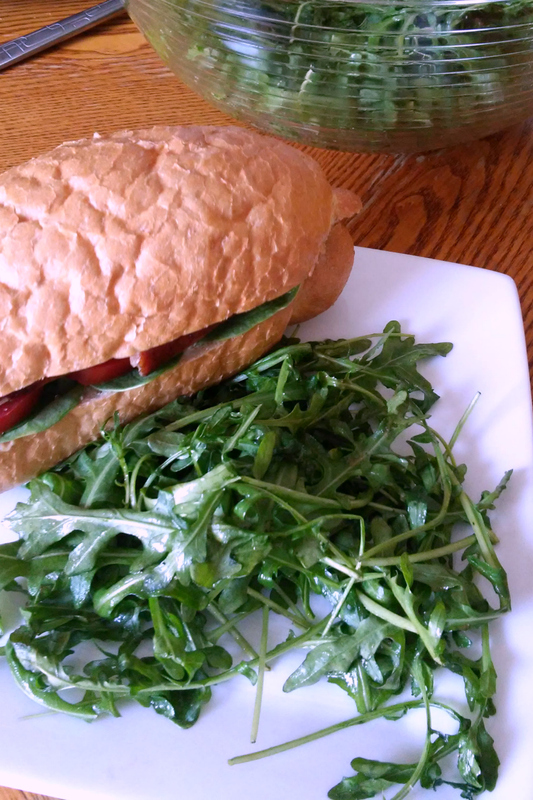 We made this Arugula Salad with Balsamic Vinaigrette as a side for choripan and it was perfect. It’s soooo easy to throw together and it tastes just a tad sweet. My husband and I ate this meal with only our youngest child at home, and since he’s just one we didn’t offer him any. I doubt my girls would have liked this, but if they had been home I would have put a small portion on their plate even if just to expose them to it. What a simple meal to throw together on a lazy day. 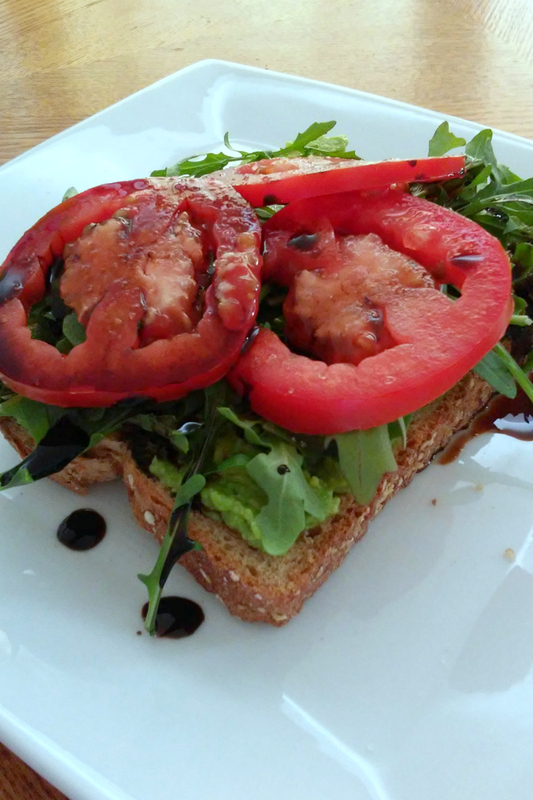 The most difficult part about these Avocado, Arugula, and Tomato Toasts w/Balsamic Syrup was…oh wait, there was nothing hard to do. Ha. It’s seriously a 10 minute meal and quite healthy. My husband is a big fan of using balsamic vinegar on his salads, so imagine my surprise when he told me that the balsamic syrup was too much. I didn’t even put a lot on his toast, but he was taking off the tomatoes so he didn’t have to eat it. I, on the other hand, loved this easy and delicious toast. Our kids didn’t eat it, but I plan to serve this more often. 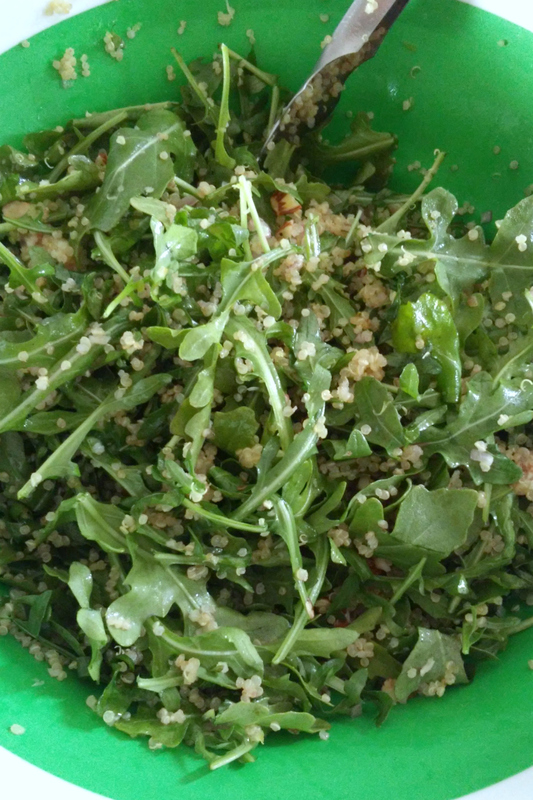 I made this Quinoa Arugula Salad with Lemon Vinaigrette as a side dish for one of my husband’s famous asados (barbecue). The almonds ended up burning instead of roasting, so I just grabbed some raw almonds to chop up and add to it. I had quinoa in the freezer for this so I didn’t have to make any the day of. My husband’s mom and sister were over for this BBQ, so I thought I would get some good feedback from someone. The only person who liked this was me, apparently. My husband had no idea I made this. He thought his sister did, and he said, “What is this quinoa doing on my salad?” Haha. There was another salad my sister-in-law made, and my kids ate it with their meat, so I didn’t offer this to them. I really should have, though. When I saw the recipe for Arugula Pesto, I knew I had to try it. It’s so ingenious. Arugula is cheaper than a basil plant where I shop, so it’s kind of a no-brainer. Of course, it would be the cheapest if I just grew my own basil, but anywho. We eat pasta maybe once or twice a month, so I thought this would be a nice surprise for my kids and husband. My husband didn’t eat this because he wasn’t home, but my kids inhaled it. 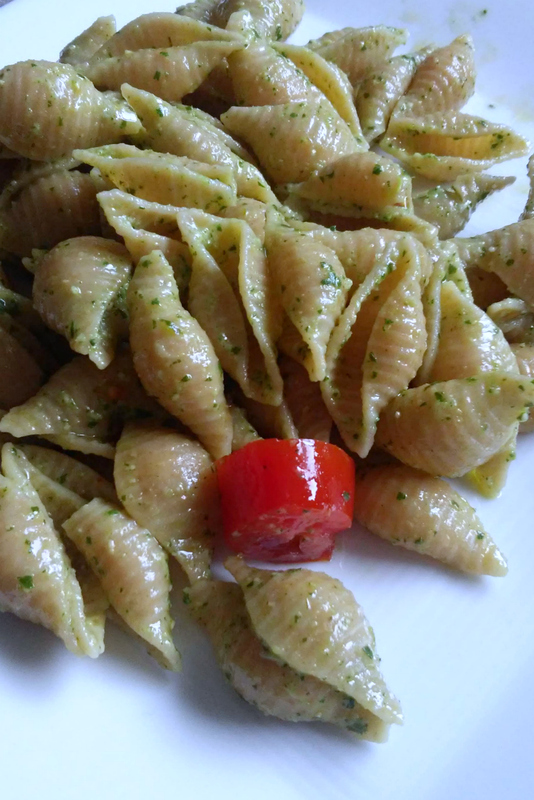 It does taste slightly different from a traditional basil pesto, but it’s a great alternative. I wasn’t going to share this one, but I figured every little bit counts, right? We ate some tuna-egg salad sandwiches and we were going to put spinach on them, but we had more arugula than spinach so I put arugula on them. Guess what? It still tasted just as good. And my kids were exposed to a different kind of lettuce. 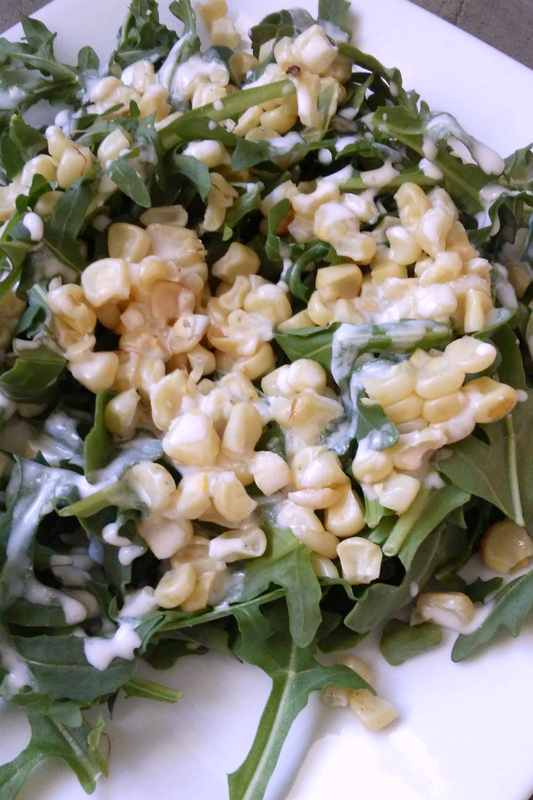 I guess you could say this Mexican Street Corn Salad was kind of a fail for my family. I was the only one to eat any of it, mostly because we were eating it with chicken and rice and fruit salad (favorites in this house!). It was an interesting salad. I had never bought Mexican Crema before, and I probably shouldn’t have made this just because it wasn’t dairy-free (and we are pretty much a dairy-free family). 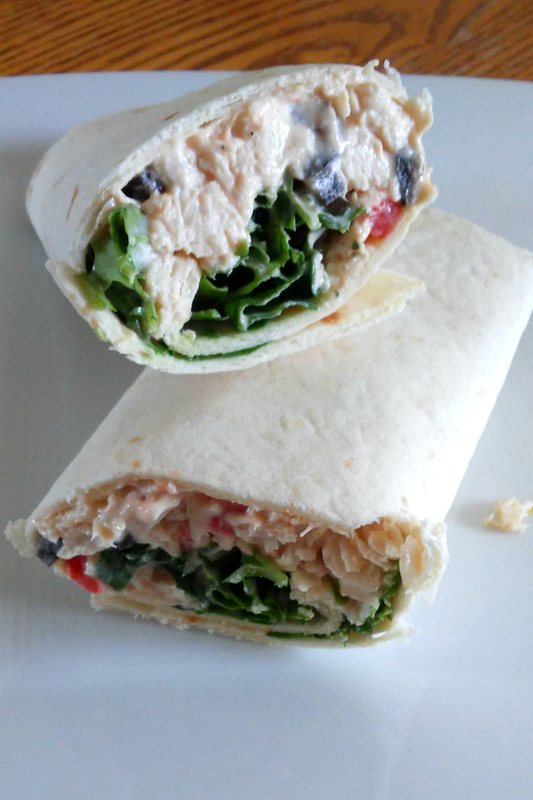 These Mediterranean Chicken Wraps were E-A-S-Y. I used leftover chicken from a roasted chicken I made, and it was a cinch to get 4 cups out of what was left. I liked this recipe because it was made with yogurt rather than mayo. My daughter and I (who have the worst issues with dairy) both ate it and had no problems, luckily. 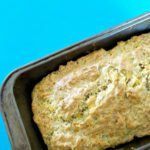 This recipe calls for arugula OR spinach, and I am thinking my kids would have liked it more if I had put spinach in theirs instead. They were picking out the arugula (except my 1 year old, strangely), and when we ate it for lunch a few days later, I didn’t give them any lettuce in theirs and they liked it a lot. I honestly don’t blame them for not liking the taste of arugula because it has taken me lots of tries to enjoy it myself. 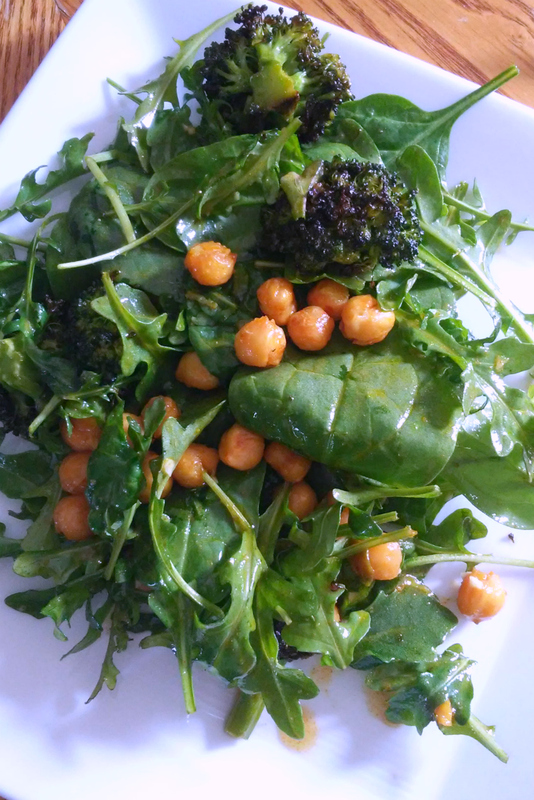 I have to say that, hands down, this Roasted Broccoli Chickpea Arugula Salad was our absolute favorite way to eat arugula out of the 9 ways we ate it. The honey lemon vinaigrette was finger-licking good and the roasted chickpeas and broccoli were a brilliant addition. Oh, and the spices made it so freaking delicious. My husband didn’t try this, but my sister-in-law, kids, and I all ate it and loved it. This is going on our list of family favorites for sure! How Much Does Arugula Cost? Arugula comes in plastic bags or containers, and this month I only ever bought mine in 5 oz. plastic containers. They ranged in price from $2.48-$2.98 where I live (in May). In total I spent $13.21 or $1.47 per meal. 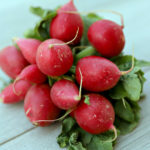 Because you buy arugula in a bag or a container (at least in grocery stores), the best thing you can do when choosing which one to get is to look at the expiration date and see if any leaves look like they are yellowing or wilted. Choose one with fresh looking lettuce and an expiration date at least 5-7 days away. Arugula tends to last for a week or longer if you store it correctly. Before you put your arugula away, take a dry paper towel and add it to your bag or container to soak up any moisture and keep the lettuce fresher longer. If you buy pre-washed arugula in a bag or container, you don’t need to do anything to prep it. But if you buy it from a farmer’s market or harvest it in your own garden, you will need to wash it well yourself. Arugula is a wonderful addition to anyone’s diet because it is just brimming with nutritional benefits. When you eat arugula, you are helping to fight cancer, protect your eyes, build strong bones, and more. You can read all about the top 10 benefits of arugula in your diet on Dr. Axe. Five months down, folks! We are now in June and the next veggie of the month will be green onions. 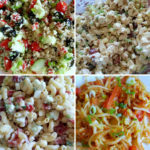 I found tons of recipes and added them to my meal plan already. When you are looking for recipes, try and search by ingredient if you can. On Allrecipes.com and some food blogs you can do that. Otherwise, check your own recipes first and make those and then branch out if you need more ideas. Oh, and some recipes use the word scallions instead of green onions, but chives are not the same thing. I used to say that you should follow me on Instagram to find out how we are doing with the challenge throughout the month, but I deleted the Instagram app from my phone. I know, shocking, right? It was taking up too much space on my phone, and, frankly, I was becoming addicted to it. It’s been a week and I have got a lot more done around my house since I no longer hop on Instagram when there is a lull in the day. Instead of sharing on Instagram, I may start a Facebook group in the near future. It probably won’t be this month, but hopefully before school starts up again in August! 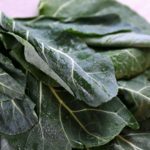 Join the 12 Month Produce Challenge! It's free and you'll get reminders to keep you on track. If you've been trying to give your family healthier food, this is the challenge you need! By signing up, you also agree to receive other emails from me. Check your email to finish signing up for the monthly produce challenge. I hope I can give you the support you need as we do this together!